Extra fluid retention in the body usually results in a swelling condition called edema. It can affect any part of the body but mostly the arms, feet, ankles, and legs. Edema can be caused by a variety of conventional medication, pregnancy or a number of underlying ailments such as heart problems, kidney disease or cirrhosis of the liver. If edema is caused by underlying disease it needs to be addressed first if there is to be any reduction of water retention. Medicinal herbs for edema treatment and relief mostly focus on addressing the causes of liquid retention in the body. 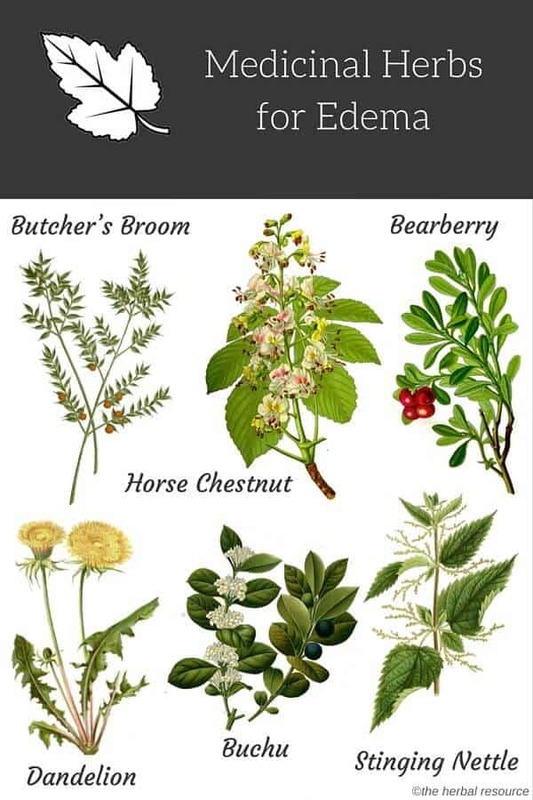 These medicinal herbs usually have diuretic properties which fight the factors that cause edema by reversing their effect and restoring the body’s fluid balance. Diuretic herbs also strengthen deteriorating blood vessels and help the lymphatic system to move excess fluids from the body. 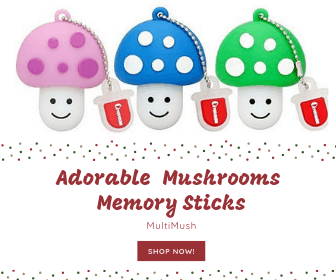 They stimulate the kidneys and the urinary tract system in order to flush out excess water and body wastes resulting in less water retention in the body. It is important to consult a professional health care provider about the use of medicinal herbs for edema prior to use, particularly for those on conventional medication or those who have a history of serious diseases. Women who are pregnant or breastfeeding should only use herbs for therapeutic reasons under the guidance of a doctor. Stinging nettle is a common plant in most parts of the world with a temperate climate. It is loaded with nutrients and has both astringent and diuretic properties. It has been used traditionally for a long time for a variety of ailments, including edema. Research has shown that it has the ability to reduce the swelling caused by edema by suppressing the release of cytokine, a substance which promotes inflammation. A common and often recommended dosage of the herb for edema is 120 mg three times daily. 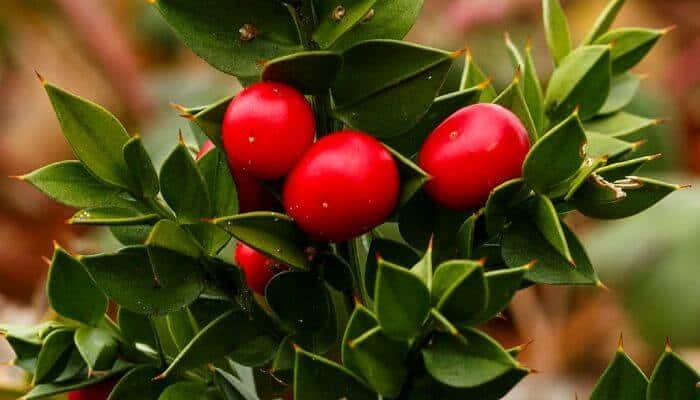 Butcher’s broom, native to Africa and areas around the Mediterranean sea, is an evergreen shrub that has been used as a medicinal herb ever since ancient times. The plant’s root which has a diuretic and anti-inflammatory properties is the part that is mostly used in herbal medicine as a treatment for edema. Butcher’s broom is one of the most studied herbal diuretics there is. It contains the steroidal saponins ruscogenin, neoruscogenin, prazosin, and diltiazem (highest concentrations are found in the root), substances that have been proven to increase the permeability of the blood vessels which allows for movement of fluids and reduces inflammation. Butcher’s broom is considered particularly effective for lower leg edema caused by chronic venous insufficiency from blood clots (deep vein thrombosis) and varicose veins. It is also used as a herbal treatment for hemorrhoids and lymph edema that women often develop after a breast cancer treatment. In addition, the herb’s anti-inflammatory properties make it useful in fighting inflammation in the urinary tract, in the prostate and also in preventing kidney stones. The recommended standard dosage for this herb is up to 11 mg three times a day. It can also be applied directly to the affected areas in the form of ointments or compresses. Dandelion is a common plant, considered a weed by many, found in most countries of the Northern Hemisphere with a temperate climate. It was used by the Native Americans to treat swelling. Today, the plant’s leaves are used for their mild diuretic properties to treat edema. The herb is often preferred over other diuretics as it does not alter the potassium levels in the body. The herb is thought to be helpful in reducing edema by eliminating water weight and increasing urination. It is also considered a mild laxative, which further boosts its effect as a natural diuretic. In one study, the herb was shown to increase urination in humans when it was administered in extract form, indicating that its traditional uses for water retention have some scientific basis. The study was first published in August 2009 in the “Journal of Alternative and Complementary Medicine. Still, more and thorough studies are needed to fully confirm the herb’s efficiency as a viable alternative to conventional diuretic medication. A common and often recommended dosage for dandelion is 500 mg of the powdered root one to three times a day. For those who prefer, it can also be used as food whether it is by blending it to make juice or use the leaves in salads. Bearberry, also known as uva-ursi, is a small evergreen shrub widespread in northern latitudes. It has been used traditionally as an herbal remedy for a variety of ailments but mostly for treating bladder infections. The plant contains high amounts of tannins known to reduce swelling and inflammation which make bearberry helpful in reducing symptoms associated with edema. A research study from the year 1992 conducted at the Kinki University in Japan showed that the leaves of the plant contain a substance know as arbutin. Arbutin has been proven to reduce swelling especially when combined with indomethacin, a nonsteroidal anti-inflammatory medication (NSAID) that reduces fever, pain, and inflammation. Since bearberry has no diuretic properties it is commonly used in conjunction with medicinal herbs that do. The standard dosage of bearberry is usually 500 mg per day. For commercial products containing the herb, the manufacturer’s instructions should be followed. This well-known kitchen herb has diuretic and anti-inflammatory properties making it useful in reducing the amount of fluid retained in the body while at the same time treating the swelling caused by the edema. Parsley contains tannins, flavonoids and some other beneficial compounds which make it effective in treating edema and gives the herb its aquaretic properties. Aquaretic herbs help to flush excess fluids from the body while leaving the sodium and potassium electrolytes levels intact. Uncontrolled studies have shown that when parsley was combined with the root of asparagus (Asparagus officinalis) which also has aquaretic properties, the mixture aided in weight loss and lowered high blood pressure (hypertension). Parsley is usually considered a safe herb to use and the standard therapeutic dosages are one to three grams daily. Still, some of the herb’s substances may cause some side effects. It is known to have a blood-thickening effect and it should not be used alongside blood thinning medications and aspirin. Goldenrod is a perennial plant, native to Europe and Asia, that is regarded as both a mild diuretic as well as an anti-inflammatory agent. These properties could make it useful for treating edema since it is thought to aide´in the removal of excess fluids from the body while treating the swelling in the tissue. The herb’s applications as a treatment for edema are mostly based on traditional and folk medicinal uses. Studies on the herb’s effectiveness for edema in humans are lacking but a study from 1992 conducted at the Cairo University showed that the goldenrod reduced edema in rats. The recommended dosage depends on the form in which it is taken. For powdered goldenrod leaves, it is safe and effective when taken in amounts of 6-12 grams daily split into two doses. Goldenrod commercial pills or capsules are also used as supplements and then the manufacturer’s dosage should be followed. It is possible to use the herb in tea form by steeping the leaves for few minutes in hot or boiling water. Taking it with water usually helps to lessen the risk of dehydration because of the diuretic effect of the herb. Cleavers are annuals plants, also known as goose grass. The herb is native to Europe, North Africa, and Asia. It gets the name cleavers from its sticky seeds and it has been used in folk medicine as a treatment for a number of ailments. The herb is regarded as a natural diuretic and it has been used for treating edema since ancient times. It helps lower the body’s water weight while relieving the swelling in affected tissues. It contains flavonoids, tannins, and glycosides that are thought to be responsible for the herb’s diuretic and anti-inflammatory effect. No scientific studies have been done in order to confirm the medicinal properties of the herb and its therapeutic applications are based on traditional uses. Many herbalists recommend cleavers to be used as herbal medicine in a tincture form. A common dosage of the tincture is 3ml to 5 ml taken three times a day. Horse chestnut is a medicinal herb that has its roots in ancient traditional medicine. It has been used mostly as a treatment for varicose veins, hemorrhoids, bruises, and ailments related digestive and urinary tract conditions. Horse chestnut does contain substances with weak diuretic properties but as an herbal remedy for edema, it is mainly used to strengthen the veins and suppress the veins’ ability to release water into the surrounding tissues. This effect reduces swelling affecting the tissue, especially in the legs. All the plant parts of horse contain the poisonous substance esculin. The raw and unprocessed seeds, bark, leaves or flowers should never be used in herbal teas or remedies. Horse chestnut extracts and supplements that have been properly processed and do not contain (or very little) esculin are generally considered safe if used for short periods of time. For commercial preparations containing horse chestnut, the manufacturer’s instruction should be followed. Horse chestnut has a blood-thinning effect and should not be used simultaneously with aspirin and other blood coagulant drugs. Gingko biloba is well known medicinal herb used to treat a wide range of health conditions. It is native to China but has been naturalized in most parts of the world. Its seed and leaves are used in herbal medicine. As a treatment for edema, it increases blood flow and circulation resulting in less loss of fluids from the blood vessels to the surrounding tissue. A standard dosage is usually 80 mg to 90 mg daily. The herb’s effects are usually not noted until after the third week of application. Buchu is a small shrub native to South Africa that has been used traditionally for a long time as a natural treatment for a variety of ailments. It has mild diuretic properties which make it useful as an herbal remedy for edema. The plant part that is used in herbal medicine are the leaves. Buchu leaves contain the active substances diosmin, quercetin, hesperidin and few others that are considered responsible for the herb’s ability to reducing tissue swelling and eliminate excess fluids from the body. The leaves also have antiseptic properties which help in the treatment of urinary tract infections and the prevention of kidney stones. Buchu is often combined with other stronger diuretic herbs for a more powerful effect. The most common way to use the herb for therapeutic purposes is in tea form. To make tea, one or two grams of the dried leaves are added to a cup of boiling water which then is allowed to steep for 10 minutes. The standard daily dosage is three cups divided throughout the day. Buchu is not without side effects or contraindications and it should not be used by people that have a history of kidney or bladder ailments. It is also not deemed safe during pregnancy and it is important to seek medical advice before using the buchu leaves as herbal medicine. Sterns RH. Patient information: Edema (swelling) (Beyond the Basics). http://www.uptodate.com/home. Accessed June 18, 2014. Belew, C Herbs, and the childbearing woman: guidelines for Midwives. J Nurse-Midwifery 1999;44:231-252Schütz K, Carle R, Schieber A. Taraxacum — a review on its phytochemical and pharmacological profile. J Ethnopharmacol. 2006;107(3):313-23. Barbara Woodward Lips Patient Education Center. Tips for managing your edema. Rochester, Minn.: Mayo Foundation for Medical Education and Research; 2010.